Have you ever been so hungry you couldn’t focus? An errand, a household chore—even the simplest task seems impossible. Now imagine you’re an elementary school student learning how to read, or a middle school student being introduced to algebra for the first time. The truth is, it’s hard to focus on anything, much less learn a new skill, on an empty stomach. And it’s especially hard for kids. You don’t need to look at the mountain of research that exists to know that kids simply can’t learn when they’re hungry. This is the message representatives from Second Harvest Heartland and hunger relief advocates took to the Capitol this week when given an audience with the House Education Finance Committee. The focus of the informational hearing was child nutrition and a state policy initiative designed to strengthen access to school breakfast for all Minnesota children. “The goal is to get legislation passed this session that will incentivize greater participation in Breakfast After the Bell, which stands to provide millions of meals annually to children from low-income households,” said Marcus Schmit, director of advocacy for Second Harvest Heartland. One in eight Minnesota children struggle with hunger. Currently, 290,000 Minnesota students participate in the free and reduced-price meal program, but only 160,000 are participating in the breakfast program. This legislation has the potential of serving an additional 130,000 low-income students if the gap is closed. 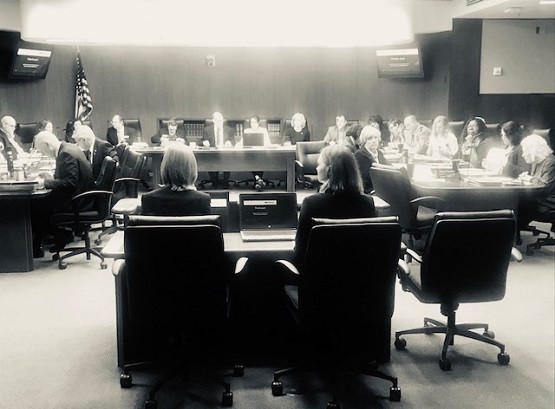 Among those who testified before the committee were representatives from the Minnesota Department of Education, Minnesota School Nutrition Association, Children’s Minnesota, Hunger Solutions Minnesota, and Second Harvest Heartland. Speaking on behalf of Second Harvest Heartland, Rebecca Mino, manager of applied research and policy, said that serving breakfast after the first bell rings helps reduce some of the stigma and shame associated with school breakfast. In addition to learning problems, kids who are hungry are more likely to have behavioral and developmental problems. Dr. Lindsey Yock, a pediatrician with Children’s Minnesota and the co-chair of the Minnesota Chapter of the American Academy of Pediatrics spoke to the committee about the science behind good nutrition. Children’s emotional and mental health also hang in the balance, testified Crystal Fitzsimons of the Food Research and Action Center (FRAC). “By putting breakfast into the daily schedule, schools are instilling healthy eating habits and socialization skills,” said Fitzsimons. FRAC sets a benchmark that 70 percent of students who participate in a school lunch program will participate in a school breakfast program. A dozen states have enacted Breakfast After the Bell legislation as an investment in a healthy, prosperous future. Fitzsimons challenged Minnesota’s legislature to pass laws that would make Minnesota a leader in school breakfast. Incentives such as meal reimbursements for school districts to either establish or expand new or existing Breakfast After the Bell programs. Support to target areas of the state where school breakfast programs can go further and reach all children in a district. Adoption and/or expansion of Breakfast After the Bell best practices as part of new and existing programs, including Breakfast in the Classroom, Grab and Go, and Second Chance Breakfast. You can help ensure that Minnesota kids have nourishment they need to thrive. If you’re a supporter of hunger-relief work and want to do your part as an engaged citizen, contact your legislator and ask them to support Breakfast After the Bell legislation (Bill Number HF 1037). Breakfast After the Bell is part of Second Harvest Heartland’s child hunger initiative—led by major public and private partners, and local communities—designed to ensure healthy child development through reliable access to nutritious food. This effort levels the playing field for all Minnesota’s children, building a healthy, prosperous future for our state.